Thanks for your patience. 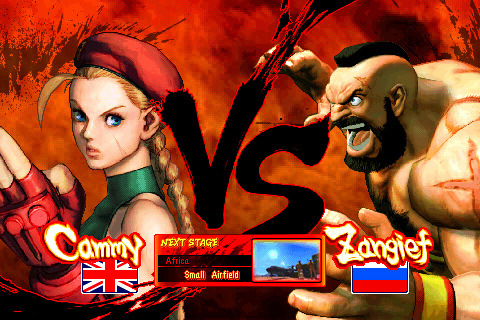 Zangief and Cammy are now available as playable characters in single player and head-to-head modes. Enjoy! –	Fight as ten Street Fighter characters in seven different environments. –	Full move sets including Unique Attacks, Special Moves, Focus Attacks, Super Combos and Ultra Combos. –	For a true arcade experience, battle head-to-head on Bluetooth against friends and foes alike. –	Robust “Dojo” boot camp transforms neophytes into Street Fighter masters in five in-depth lessons. –	Customize the controls for your style of play. Move the buttons anywhere you want on the screen and set the level of transparency. –	Unleash super moves with a tap of the “SP” button, or toggle it off from the “Options” menu if you want to enter the button combo manually. –	Four levels of difficulty.